TAMPA, Fla. -- It’s not a good idea to get between a hungry animal and its food. This can apply to humans, too, especially when it comes to their favorite dishes. So it was with a little fear and trepidation that University of South Florida Visiting Instructor Sara Dykins Callahan offered her new course, The Ethics of Food Production that concluded its pilot outing last semester. “This course makes a case for why the humanities are a part of this global and sustainable trajectory of the university,” Callahan said. In addition to lectures, reading and discussions, the idea was to have the class participate in the process of food production via a community garden. 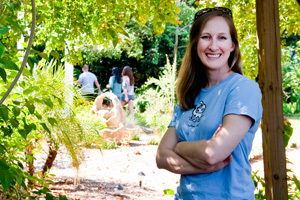 Callahan’s experience with amateur gardening sealed it and the course was born with the help of the staff at the USF Botanical Gardens, Director Laurie Walker and Special Events Coordinator Kim Hutton. Callahan didn’t want to simply say, “Oh, how horrible things are.” She wanted to have the students brainstorm solutions, ask critical questions of themselves and society and get their hands dirty to appreciate how relatively easy it is to grow organic food. With a design and a location in place, she still wasn’t sure what to expect. But The Ethics of Food Production course filled up quickly, with a waiting list, no less. By the end of the semester the class was dining together on food they planted, grew and prepared with their own hands. Between the first class and the last a lot had happened. Starting out, the students weren’t exactly sure what to expect either. At least one self-proclaimed “conservative” said he felt he wouldn’t fit into a course that planned to explore the “distancing from our food sources” and the affect on “our relationships to the Earth, to our spirituality and to one another…,” according to the course description. But looking around for a capstone course or to fill a requirement led him and just about all the students to consider the class. Being open to something new paid off. Senior Vanessa Michel, a behavioral science major, said, “I could have picked any other class and I saw food, and I like food so, I’m like hmm, interesting. So then I took it and it was way more than what I signed up for!” She meant this in a good way. Like all of the students interviewed, she said it was fun -- more fun than expected. The love of food also drew in junior Chelsea Klotz, a criminology major. And she wasn’t disappointed. But the course had its impact on Lonergan. Senior Rene Zapata, an international relations major, didn’t have to work as hard as he expected. “It’s actually a lot more fun than I thought it would be -- usually when you think of farming you think of hard work, back breaking labor, planting, but actually it allows you to connect with nature again and to be a part of something big even though it’s on a small scale. The course produced a range of changes in points of view regarding food. At one end you can put Jason Hicks, the conservative junior in economics. He enjoyed the class after all but is “certainly not going to change into a vegan or a vegetarian,” he said, declaring he will continue to eat meat. But he is now an educated consumer. On hand for the harvest feast at the end of the course, where students shared garden-grown lettuce and homemade organic treats, Belgrad saw firsthand how students took to the whole experience. Talking and laughing together, they had clearly bonded sharing the task of taking turns to tend their plot of land. Callahan is ready for more.